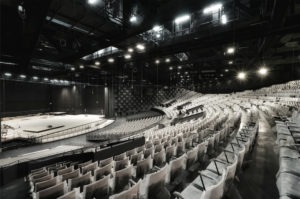 Boët StopSon’s acoustic doors measure 7m x 5m at the Seine Musicale! After 3 years of work and a 170 M € investment, a magnificent concrete liner dedicated to music opened its doors on Seguin Island in Boulogne-Billancourt. This ensemble is a unique project in France and in Europe. Inaugurated on April 21 by Bob Dylan, the Seine Musicale will offer a mix of musical genres that will resonate in the 36,500 m² area site. The design of the large 280 meter long building was entrusted to the architect Shigeru Ban and his partner Jean de Gastines. The scenography of the rooms was carried out by the agency DUCKS scenario while the acoustic studies were entrusted to the offices Nagata Acoustics and Lamoureux Acoustics. Designed, manufactured and installed are two large acoustic door blocks (7000 x 5000mm HT) while guaranteeing an acoustic performance level of 50dB (on each door block). All this taking into account the technical, architectural and aesthetic constraints imposed by the project management. Boët StopSon’s experience and know-how in the building sector have enabled us to develop a system that meets all the requirements of the specification provided by the customer of Bouygues Construction. 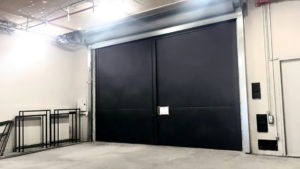 These two double doors, with a unit weight of nearly 3 tons with manual opening (thanks to a hinge system of Boet StopSon design), allow access between the logistics area and the rear of the main stage providing optimal soundproofing.